Singaporean iPad, iPhone and Android Blog: How to take a screenshot image of an iPhone, iPad or iPod Touch, without any third party apps. How to take a screenshot image of an iPhone, iPad or iPod Touch, without any third party apps. 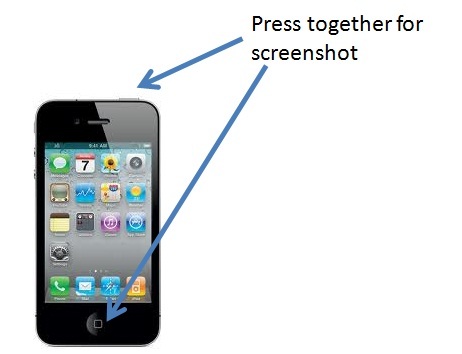 Now that we’re at the threshold of iOS 4.3, one simple tip that ought to be revisited is an easy but still not well-known method to take a screenshot or screen image and save them in the Photo application for easy transfer via email. This method, which has been in use since iOS 2.0, still works on the iPhone, iPad and iPod Touch in the latest iOS versions. There is no need for any third-party applications. 1. Open the application and go to the screen you want to capture. 2. Hold down the circular Home button located below the display. 3. Press the Power On/Off button once. The screen will turn white for an instance. To look at the screen captured image, open the Photos application. Now you can email the image and transfer it easily for your blog! Thanks Lee for informing about such a useful option. I haven't tried it yet. It makes my work really easy to share whatever i like & email it to my friends & colleagues.